Disclosed is a pontoon boat. The pontoon boat includes a deck, a pair of pontoons, an elongated channel member and a boat. The pair of pontoons is disposed on a water side portion of the deck for supporting the deck above a water level. The elongated channel member is disposed on the water side portion of the deck between the pair of pontoons. 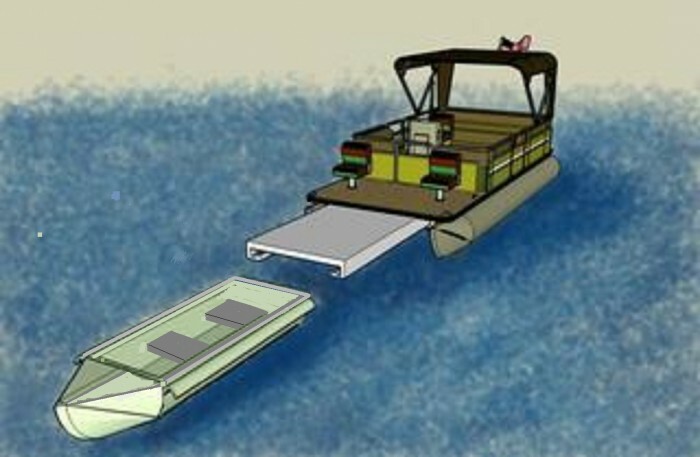 The elongated channel member is configured to have longitudinal sliding movement with respect to the water side portion of the deck. The boat includes a body portion and a pair of lip portions. The pair of lip portions is configured to be slidingly received in the elongated channel member for removably securing the boat to the water side portion of the deck. I am looking for (an outright sale, or a license with royalties, or any combination of the two.) I am the sole owner of the patent. It is free, and clear. The patent has never been sold or licensed. The boat has never been previously sold or marketed. I am looking for a company to build the small boat only (the center pontoon) an after market product that will bolt under the deck, and slide out and detach from the pontoon boat, It will be equipped with seats, and all accessories for fishing. 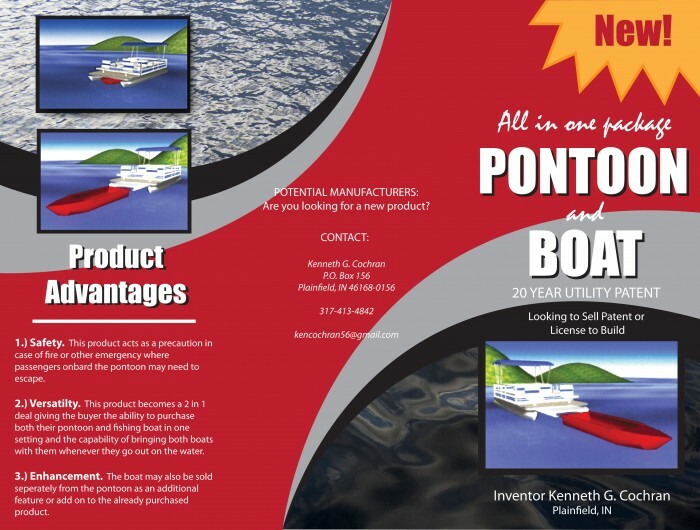 The market potential is every pontoon boat in existence. The annual production of 38 companies in the U.S. alone would be a task to fulfill. A favorable market analysis rated this over 70% in every market category for high success rate. 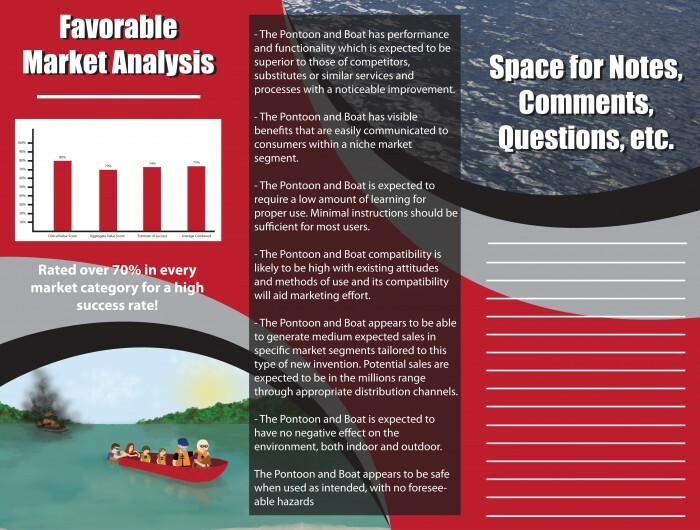 pontoon boat sales have increased tremendously in the last few years and the kayak is starting to boom. This small fishing boat could replace the kayak in a lot of ways such as the convenience alone as it is always with the pontoon boat. A pontoon boat company with this product could be the leader of the pontoon boat world. 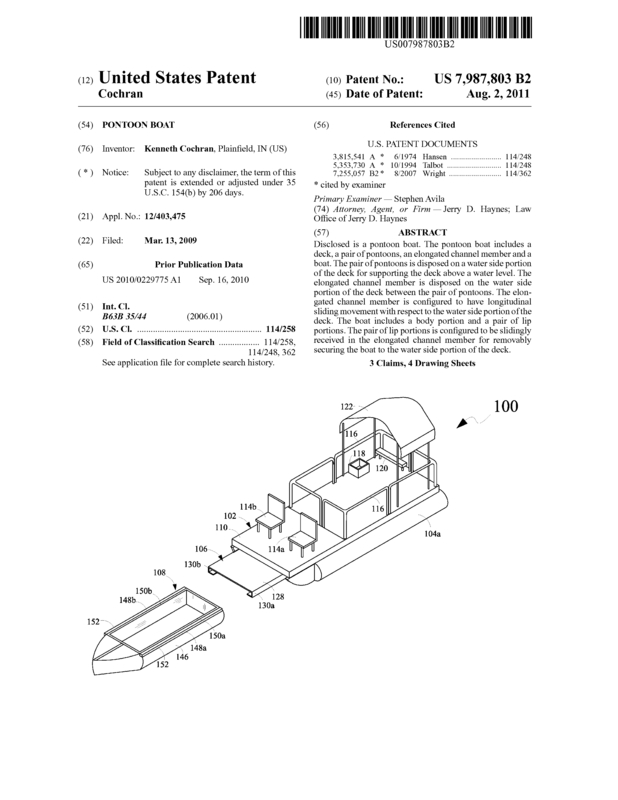 Page created at 2019-04-25 4:47:28, Patent Auction Time.